It is five years today since Meg fractured her elbow and this whole merry-go-round began. We used to celebrate MegLeg day, but that doesn’t seem appropriate any more, given that she no longer has it…. lol. Five years. It does make me slightly sad to think just how long we have been battling this, and what a great proportion of Meg’s life has been affected by orthopaedic issues. She was around three and a half when it happened. Today she is eight and a half. And in all likelihood, though she did not display symptoms, she had been in at least some degree of pain since puppyhood. 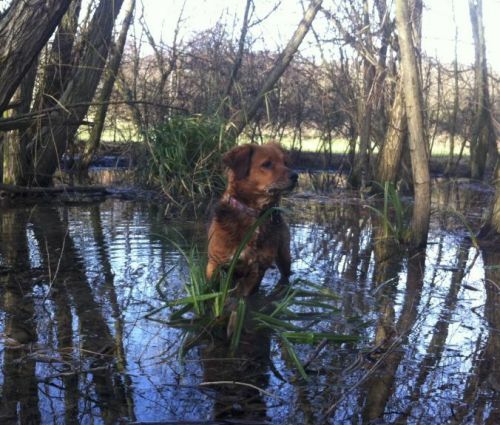 What I did want to do was share a little bit about Meg’s condition, as it wasn’t something I’d ever heard of and to this day I have never met a single person who has had a dog with it. There is not a single reference to IOHC on this site (other than from me), and if you think of all the dogs who’ve been through here, that’s really saying something. To the best of my (limited) knowledge IOHC has not been found in cats. Tina tells me that horses can suffer from a similar condition. While, on the one hand, it is obviously good that the condition is rare, as it’s pretty devastating, or can be, I must confess it does make it feel like we’re walking a bit of a lonely road at times. So, Incomplete Ossification of the Humeral Condyles (IOHC), is a condition where the centre of the humerus has not formed solid bone. As it was explained to me at the time of Meg’s elbow fracture, when puppies are born, the centre of the humerus just above the elbow is composed of fibrous tissue, which turns to bone (ossifies) between 8-12 weeks of age. Occasionally this does not happen, the condyles do not fuse together, and the dog is left with a hole, essentially at the bottom of the humerus. Recent research, conducted since Meg’s fracture, suggests that the condition can also develop by means of a decalcification process, and it may be related to elbow dysplasia. It’s fair to say that this is not a condition which is well understood, and a lot more research is needed both into causes and potentially also treatments. IOHC is most commonly (by far) found in English Springer spaniels, suggesting a genetic link, but there have also been cases in Rottweilers and labradors. It is extremely unusual in a Mutt like Meg. 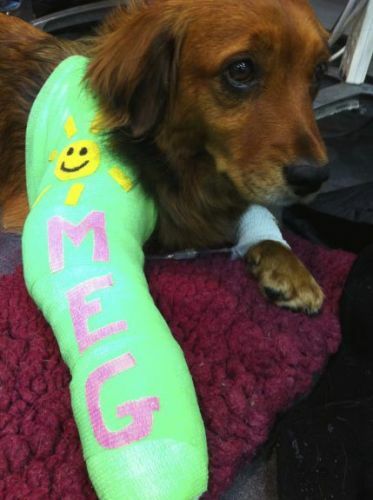 The only case Meg’s rehab vet, who we worked with after her fracture, had ever encountered was a police sniffer dog, a springer spaniel, and as it happens the first dog sent onto the bus which exploded during the London bombings. He won an award for bravery. Then shortly after went on to suffer a non traumatic, explosive fracture of the elbow. Exactly the same as Meg. 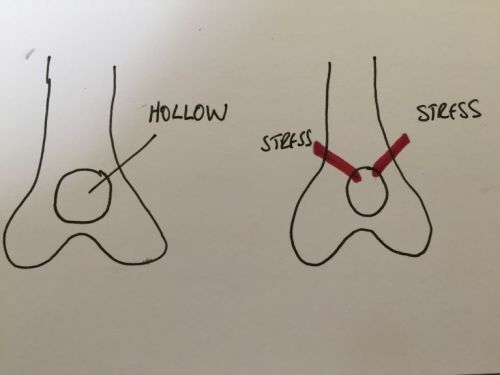 What happens in IOHC is that the existence of the hole at the bottom of the humerus places great stress on the condyles (the side bits). There may be indications such as limping, or there may be no indication at all that anything is wrong. Then (and, to be clear, this doesn’t always happen) the dog is trotting along one day and out of the blue the elbow essentially explodes. This is what happened to Meg five years ago today. She was running on grass, and her elbow just suddenly exploded. 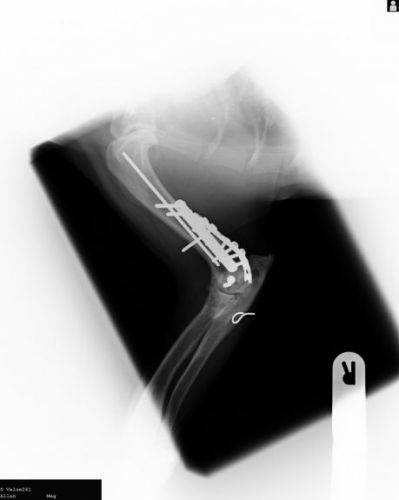 Meg’s elbow was fixed with a five hour operation involving plates, pins, screws and more than a metre of wire. She recovered well after extensive rehab, but a couple of years later had developed end stage arthritis. The bigger problem is that IOHC is often bilateral. Ironically enough, Meg’s (right) elbow replacement was intended as a way of saving her left leg. The plan was that the leg with the replacement elbow would take over as her ‘good’ front leg, and this would help to lessen the risk of the left front leg fracturing. The (bitter) irony is that as a result of complications following surgery, she lost the leg altogether, and is now entirely dependent on the one leg with dysplasia and arthritis, which may well be related to the IOHC. This is actually after they’d reoperated to remove some of the metal, as Meg had problems with healing. It was because of the problems with her left foreleg that Meg was not considered a viable candidate for amputation, but given that by that point the ONLY alternative was euthanasia, I decided, after much agonising, that we needed to give it a go. I told myself that if she could just have a year swimming and doing all the things she enjoyed (her exercise is moderated, obviously, but she has to be free to be a dog) then it would be something to compensate for all the hell she went through trying to save her leg. In all honesty, I didn’t really expect her leg to last that long. Next week is her 15 month ampuversary, and she seems to be doing very well indeed. Though obviously we live with the knowledge that her elbow could explode at any time, we do everything we possibly can to help her (low body weight, lots of core strength work, regular visits to the rehab vet), then just focus on being more dog. I’ve not heard of this condition before but given Meg is a Megastar, nothing “ordinary” will do for your girl. 15 months is an impressive milestone! Perhaps instead of MegLeg day celebrations, you just shift to MegPegleg day on her ampuversary? Either way, Izzy will be glad to partake in a pupcake to share in the celebration! Thank you for the strength itntook to share this. Without question it will be a go-to source here for anyone facing this challenge. With it being so rare, I wonder how many cases go undiagnosed, or, as you well know, misdiagnosed? It astounds me, absolutely astounds me, the many different layers of the fabric of life MUTT LIKE MEG-MEGASTAR has uncovered for you…for all of us!! From my heart to yours, thank you…..
WOW Clare!!! I had no clue about this either. Thank you for the detailed and thorough and understandable explanation. Medical terms sometimes sound like mumbo jumbo to me. And Meg… how lucky is she that she was dropped (or rather handed) directly to you. Can you even imagine her life if she didn’t come to live with you? What a lucky star! And you know I get that about plating the leg and the ultimately taking it and putting them through all those surgeries. It is a tough pill to swallow when you really think about it BUT I know that dogs live in the moment so they don’t really know that they had to go through so much to get to peace and painfee (however our checkbooks say otherwise). Clare, THANK YOU for sharing this valuable, important information with the community. It’s never easy being the only person dealing with a certain diagnosis but you and Meg handled it like the champs that you are. Although I hope nobody ever had to face the same diagnosis, if they do and they end up coming here to read about Meg, I know without a doubt that they will find the hope and inspiration they need to face the future with courage and optimism. Thanks for all you do. Hoppy Ampuversary Meg, keep on truckin’! Oh Meg you have been through so much! Megastar even comes up short in discribing you. As I look at those first two pictures (you in the cast and with your vet) I find myself tearing up because your little sweet face seems to radiate pain. I’m so glad your Mum has shared many more of the post amp pictures where you are happy and living life large like your Megastar personality dictates you should. So happy Clare you took that leap of faith to amputation. What a balancing act you must do each day to both let Meg enjoy life while protecting her as best you can. You and your pack make me smile…..a lot…well done both of you!! And yes Miss Pie I’m remembering your terrible reaction to the opioids too lest you think your Auntie Linda is forgetting about you. You too are a trooper! Love and hugs to you all! Well you know your never alone in this journey even if you have a rare case! I am glad you took the time to write all this it will surely be of help to others one day! Meg being the star she is, is making history ! The dog that was not candidate for amputation,Well again we love this because we love it when our love for our animals do make a difference and clearly your love for meg has been miraculous ! I am sorry you guys have had to go thru so much! But look where you are now! I too wonder how many are misdiagnosed or sadly are not documented because someone chose the end of life. I have read the term before from you, but never really understood what it meant! Wow it is interesting and disturbing to know. Meg has this on her only front leg & there is no clear definitive way to know if the other will go. Scary! Well clearly you have surpassed any statistic and Meg continues to be the MEGASTAR she is! With everything you are doing with her it is working !! I’m sure if the leg would get worse you would have options then too! All the braces and other devices available for dogs now I would think something would be available to help lessen the stress even further if need be. I cannot imagine all you guys have been thru & then having to amputate the leg! I still cannot get over how she changes as she ages. I don’t know why not its the way it is with us! The photo with the decorated cast OMC she does look sad & adorable as she always does! Thank you so much for sharing Meg’s journey and the start of it with everyone. I have heard of the term of course because of having Rotties. Jazz they thought might have this but thank goodness it wasn’t. I understand the feeling of being alone on this because of her diagnosis but know we are all here for you & Meg. I am so glad you joined the community and I got a change to meet the Megastar’s mum. You have been on one heck of a journey with Meg and you are letting her be a dog and that is what is most important. Yes, you are doing your watching and making sure she is careful but yet she is enjoying her life. You really are the sweetest people on earth. If there’s one good thing to have come out of Meg’s struggles, it’s that they brought us here to discover this extraordinary community. Please don’t anyone think I’m complaining when I said it could feel a lonely road at times. I probably didn’t express myself very well. I just meant that I sometimes miss the way in which you can compare notes with somebody going through the exact same thing. There was a lot of that going on last weekend and it was actually really moving to see the way in which people were able to connect through very similar experiences. It cuts both ways too, of course, if there were lots of dogs here with IOHC and their elbows were giving out one after the other, that would be particularly difficult to deal with. As Meg and I are the only ones in her situation, we are not faced with constant reminders of the tightrope we are balanced on, the drop beneath our feet. 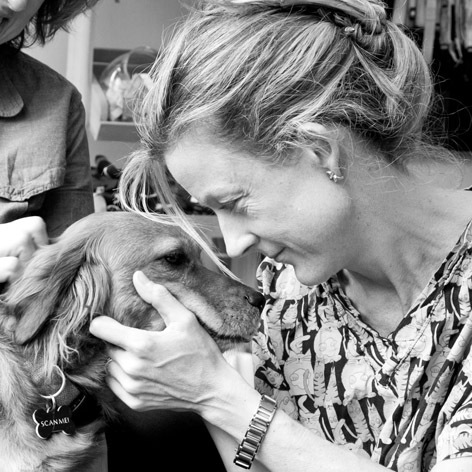 By far the most important thing this community (all of YOU) offers is the emotional understanding (together with a wealth of expertise), the total, non judgemental acceptance, the fact that you all understand what it’s like to love a dog, cat, chicken or rabbit to the ends of the earth and back again. You have been there for us again and again, we have received the most tremendous support, whether for the Tripawd or the Piepawd, and we love you from the bottom of our hearts. You worry too much Clare, we totally know what you meant and understand that there is a lot of comfort in being able to talk with others about your own specific situation. No worries there, promise. Ditto what everyone else said! I think it is wonderful that you took the time to write so clearly about IOHC so we could all understand what you and Meg have been through. 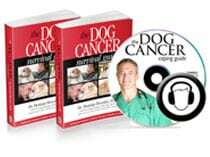 And surely it will help someone else down the road whose dog comes up with the same diagnosis. That is such a huge part of this community, us all sharing our experiences so that in the future maybe others don’t have to feel so afraid and alone. And the more we share the more people we can reach! And BTW you can always vent and whinge at any time around here, hadn’t you heard? Not that I am saying that is what you were doing by any means! Clare, I have not been around much the last few years so have not followed your story with Meg too closely but thanks to the BEST PAWTY EVER I feel like I have gotten to know you and the others who attended a little better. I love it!